By : Carolyn Wing Greenlee, Dennis L. Greenlee, D.C., L.Ac. Posted in Books, Instruction, Microcurrent Therapy, Products. 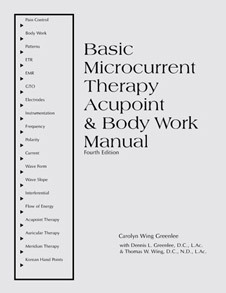 Originally written as a training manual for health professionals treating patients with Monad Microurrent instruments (invented and manufactured by Dr. Thomas W. Wing), the Basic Microcurrent Therapy, Acupoint & Body Work Manual has become a staple in Microcurrent Therapy education and treatment, regardless of which brand of instrument is used. Want to know what microcurrent can do? Wonder what settings to use? This book is intended to be an inviting introduction for the beginner or a thorough brush up for the intermediate user. From simple body patterns that relieve pain to a simplified system of auricular therapy to an interior look into the body through meridian balance, it offers a spectrum of approaches. The techniques which have revolutionized sports medicine–EMR (Enhancing Muscle Reeducation), ETR (Enhancing Tissue Repair), and GTO (Golgi Tendon Organ)–are explained and illustrated with diagrams of the physiology involved. A new simplified method of charting meridians, the neurological basis of auricular therapy with the progression of diseases, and an entire chapter on Korean hand acupoint therapy in three levels: Corresponding Points, Basic Points, and Meridian Points. This is a hands-on manual that guides the reader step-by-step through the basics of microcurrent therapy. 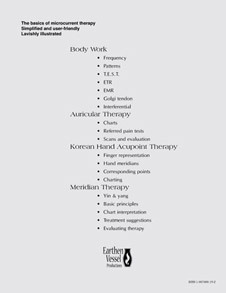 Details of instrumentation, applicable bodywork patterns, microcurrent inferential, auricular treatment procedures, meridian therapy, Akabane, interpretation protocol, five phase, Luo, sedation, and supplemental points, source, master, and association points, Korean hand therapy, and a variety of miscellaneous point treatment strategies are all covered in this ambitious and useful book.